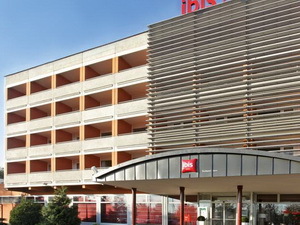 Debrecen hotels. 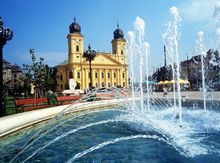 Travel guide of Debrecen, Hungary. Once upon a time, DEBRECEN was the site of Hungary's greatest livestock fair, and foreigners tended to be snooty about "this vast town of unsightly buildings" with its thatched cottages and a main street that became "one liquid mass of mud" when it rained, "so that officers quartered on one side were obliged to mount their horses and ride across to have dinner on the other". 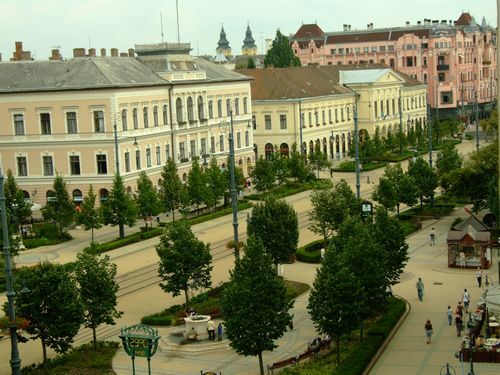 Even so, no one can deny the significance of Debrecen (pronounced "Deb-retzen"), both economically and as the chief center of Hungarian Calvinism. From the sixteenth century onwards there wasn't a generation of lawyers, doctors or theologians that didn't include graduates from Debrecen's Calvinist College (the city is still renowned for its university and teacher-training colleges); while in the crucial years of 1848-49 and 1944-45 it was here that Hungary's future was debated. The early Calvinists' hatred of popery was only exceeded by their animus towards pagan beliefs amongst the peasantry of the Plain, who regarded táltos (village wise men) with benevolence, while fearing "boszorkány", their female counterparts. Until the eighteenth century, women accused of witchcraft were able to plead that they were beneficent táltos (for example Frau Bártha, who claimed to have learned táltos skills from her brother), but as the Calvinists' grip tightened this defense became untenable. Midwives were particularly vulnerable as it was popularly believed that the murder of a relative or newborn child was a prerequisite for acquiring their "magical" skills, but women in general suffered from the Calvinists' witch-hunting zeal, which also found scapegoats in herbalists beggars and vagabonds. Debrecen, as Hungary's second largest city, still follows the old, much maligned main street, which a few years ago reverted to its former name of Piac utca (Market Street) after forty years of being called Vörös Hadsereg Útja in honour of the Red Army. 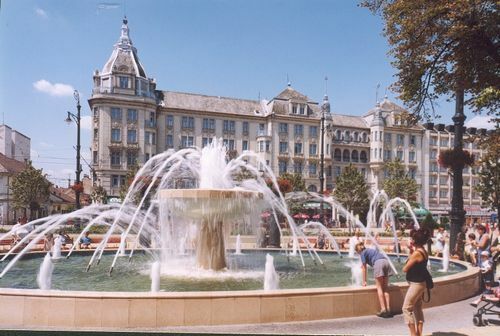 Approaching from the direction of the train station you'll pass the former County Hall at no. 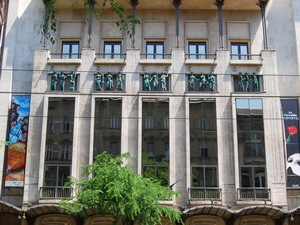 54, whose facade crawls with statues of Hajdús made from Zsolnay pyrogranite. 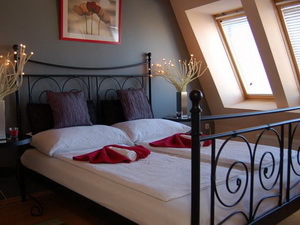 Further up, on the other side of the road, are the nineteenth-century Csanak House (no. 51), and the Romantic-style Small Church, whose bastion- like top replaced an onion dome that blew off during a storm in 1909. Facing the church is a Secessionist pile with a gilded doorway, originally a Savings Bank whose premises rivaled Budapest's Gresham Building for lavish ornamentation. 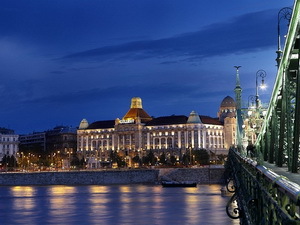 A little further on the road widens into Kossuth tér and Kálvin tér, dominated by two monumental edifices. The Great Church (Nagytemplom) is an appropriately huge monument to the Református faith that swept through Hungary during the sixteenth century and still commands the allegiance of roughly one third of the population. 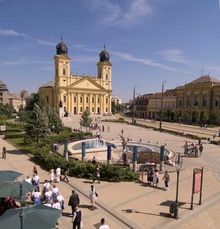 Calvinism took root more strongly in Debrecen than elsewhere, as local Calvinists struck a deal with the Turks to ensure their security and forbade Catholics to settle here after 1552. 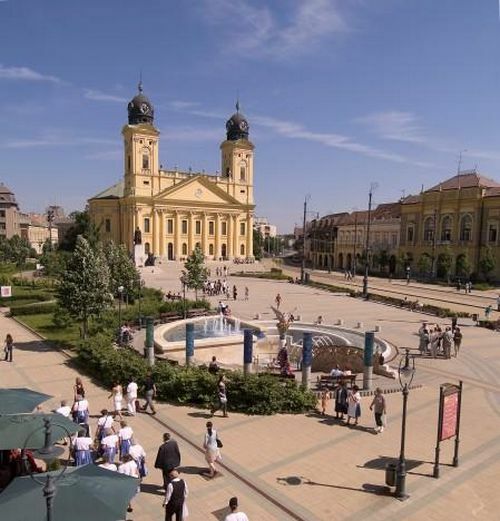 In 1673, the Catholic Habsburgs deported 41 Calvinist priests (who ended up as galley slaves), but failed to shake the faith's hold on Debrecen. A reconciliation of sorts was achieved during the pope's visit in 1991, when he laid a wreath at their memorial. The church itself is a dignified Neoclassical building designed by Mihály Pollack. 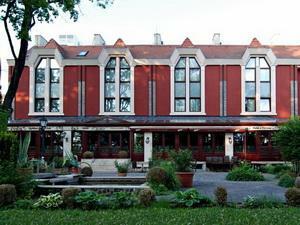 Its typically austere interior accommodated the Diet of 1849 that declared Hungary's secession from the Habsburg empire. The Rákóczi-harang - forged from cannons used in the Rákóczi War of Independence - is the largest bell in Hungary. 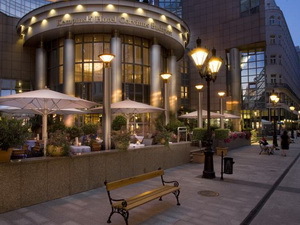 Around the back on Kálvin tér stands the Calvinist College (Református Kollégium), where students were compelled to rise at 3am and be in bed by 9pm until the end of the eighteenth century. The college motto, inscribed over the entrance, is orando et laborando ("praying and working"). Though venerable in appearance, this is not the original college founded in 1538, but an enlarged nineteenth century version. 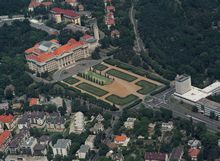 It was here that the Provisional National Assembly of leftwing and center parties met under Soviet auspices late in 1944, unwittingly conferring legitimacy on the Soviet occupation. Visitors can inspect a Museum of College History whose exhibits include a meteorite which landed near town in 1857, as well as the Oratory and library. A short walk west of the college is the excellent Déri Museum fronted by allegorical statues by local sculptor Ferenc Medgyessy. The collection contains paintings and ethnographic material including the traditional shepherds' cloaks (szűr) which played a significant role in local courtship rituals. A herdsman would "forget" to remove his finest szur from the porch when he left the house of the woman he was courting, and if it was taken inside within an hour then a formal proposal could be made. Otherwise, the cloak was hung prominently on the verandah - giving rise to the expression kitették a szűrét ("his cloak was put outside"), meaning to get rid of an unwanted suitor. A separate gallery contains paintings depicting romantic and patriotic themes by Viktor Madarász, Bertalan Székely and Mihály Munkacsy (1844-1900). 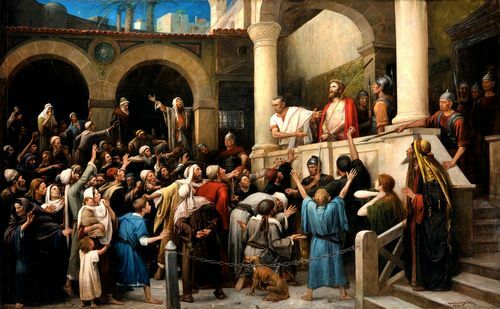 Pride of place is given to the latter's vast canvas Ecce Homo, an allegorical representation of good and evil, truth and falsehood, which toured the world in the 1890s. 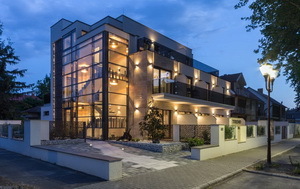 Having viewed it in Dublin, James Joyce commented: "It is a mistake to limit drama to the stage; a drama can be painted as well as sung or acted, and Ecce Homo is a drama". 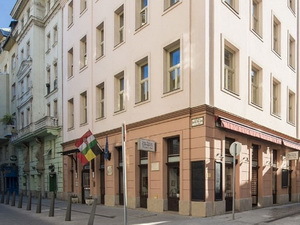 Although the small Postal Museum at Bethlen Gabor utca 1 is strictly of interest to philatelists, you might consider visiting the Medgyessy Museum at Péterfia utca 28, which honors the locally born sculptor Ferenc Medgyessy (1881-1958). 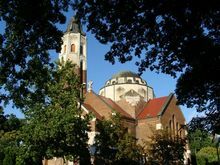 Given the focus on Calvinism, it's easy to overlook the existence of other faiths in Debrecen. A case in point is the pair of neglected synagogues in the backstreets west of Kálvin tér. On Pásti utca stands an eclectic-style Orthodox Synagogue dating from 1913 (now closed to the public), a block south from which you'll find the Status Quo Synagogue on Kapolna utca, built to serve the so-called Status Quo or middling-conservative Jews. If ecclesiastical architecture is your thing, consider tracking down St Anna's Church, a couple of blocks east of Piac utca, which is Catholic and Baroque and originally belonged to the Piarist order. Above the portal you can discern the coat of arms of its founder, Cardinal Csáky, while next door is the former Pianist grammar school, with an exhibition on their educational methods (mid-Sept to late May Mon-Fri Sam-2pm). 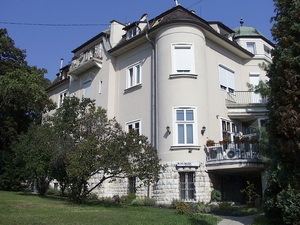 The street on which it stands was previously called Béke Útja (Peace Avenue), which raised a mordant chuckle amongst the townsfolk, since it leads to a slaughterhouse beyond the Greek Orthodox Church on Attila tér. 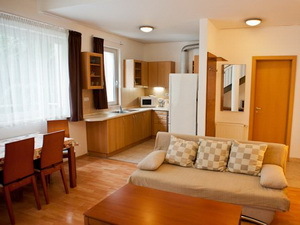 North of Kálvin tér the city turns greener and quieter, with stylish residences lining the roads to Nagyerdei Park. 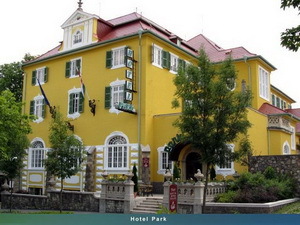 In the western section you'll find the thermal baths, fed by springs of sulphurous "brown water" (barna-víz) rising up from beneath the park. 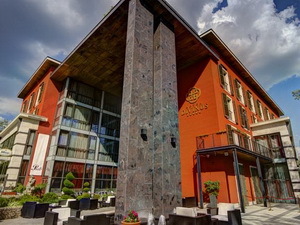 If it hasn't been removed by now, the plaque by the entrance reads: "Created with the support of the Workers' and Peasants' Revolutionary Party for the health of the workers." 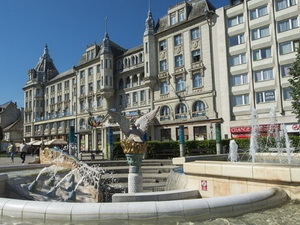 Beyond the reedy lake and wooden footbridge rises the columned bulk of Kossuth Lajos University, fronted by fountains where newlyweds pose for photos. 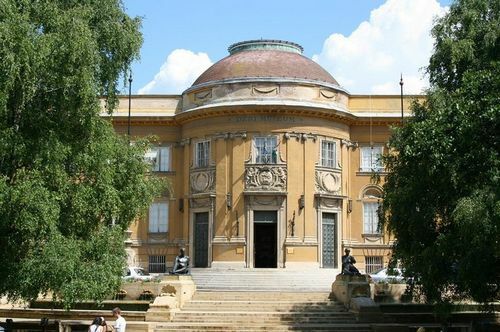 The university hosts a Hungarian language summer course (Nyári Egyetem), usually in late July, which draws students from nations as diverse as Sweden and Vietnam - a good place to meet foreigners. Beyond the campus lies a Botanical Garden. 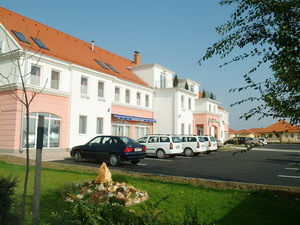 4-star hotel in Debrecen, 220 kms from Budapest. 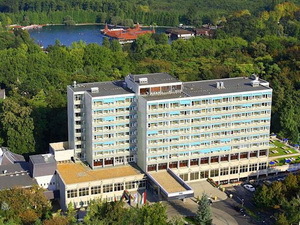 5-star hotel in Debrecen, 220 kms from Budapest.